If you are from North America, what is your ethnicity? If you are from Asia, where are you from? If Super Sentai had any crazy scientist in any of the series, they didn't spend their time stalking the rangers or just there to make us laugh, they were vital to the script. Instead they became mentors or assistants. 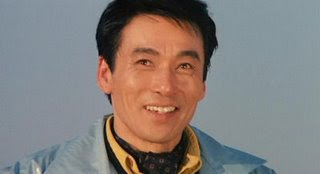 Take Dr. Dazai, Dr. Kubota, Dr. Makino and Dr. Amachi as funny geniuses in Super Sentai. Hmmm they can drink a cup of tea with Professor Phenomenus who'll feel jealous with them telling him stories of their exploits with aliens and monsters. IMO the Sentai funny geniuses are more prone to comedy than Professor Phenomenus ever was. If anything has gotten more annoying is that, well... spam comments are getting into this blog. Good thing though that Google has managed to create a way to filter them. Can't help it if spam comments are coming this way. Why? This blog has plenty of viewers in a day with 66,817 viewers as of recent and yesterday, I just had 792 viewers. So I guess I'll have to bear with spammers. Hmmm... really bad of men never to think of giving this rather interesting character a spotlight. So where do I begin? So okay, she was just some woman found in the rubble by Inou Masumi who had no memory of her past and was dubbed as Natsuki Mamiya so she could fit in the present society. As someone who has no past experiences, she is the most childish of the Boukenger team and can be a frequent source of irritation to the more serious members. She is overly energetic and optimistic towards life compared to the rest. She has a brotherly relationship with Souta Megumi which can at times, annoy Inou Masumi who also acts like a big brother to her who can get mighty overprotective of her. She also had a special sisterly relationship with Sakura Nishihori, who was at first her opposite in terms of personality. How do you find Goseiger lately? Just took this picture from Henshin Grid. Hee hee. It's all Lavender Ranger's speculation! Do you think the Goukaiger rumors are true? Ako Hayasaka/Blue Swallow- Okay I don't find her pretty but she is a pretty lively, outspoken person who can cheer the whole team up. She has had a good chemistry with the whole team even with the rebel type ranger Gai Yuuki. 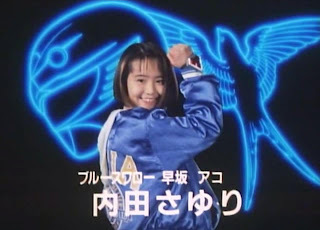 IMO she's even livelier than my favorite ranger Ryu Tendo. Umeko Kodou/Deka Pink- It was fun watching her bubbly attitude and the fact that she gets into disaster situations and pulling herself out of them. Saki Royama/Go-on Yellow- If anybody IMO made Go-onger lively, it was her. She is the least impulsive person in their team. Kotoha Hanaori- It was fun watching her cope up with being the youngest person of the team and her partnership with Chiaki Tani was another thing fun about her. Fortunately she's less of a comedy relief. 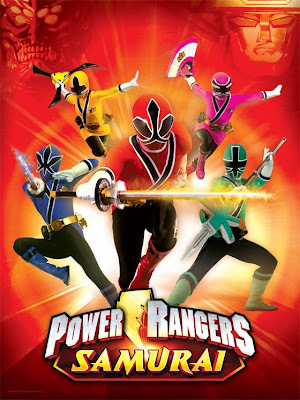 For the first time, this Power Rangers series has a title more straight to the theme as in just "Samurai" instead of the past where it had two words like "Lost Galaxy". Somehow, Saban may be simplifying titles. So far the names were changed. We have Jayden, Kevin, Mike, Mia and Emily. Cooler than the previous names which were Reese, Baron, Perry, Sadie and Ava. Since the red ranger, Jayden, is American so it's most likely he's no shadow warrior and just your American guy interested in martial arts. Although their mentor is played by an American, but in the script he's most likely Japanese. Naming him Takeru may be tribute to the original series. So I think the mentor will not be serving as an attendant to Jayden but the regular Sentai mentor.Probably these guys know nothing about kanji except for the Asian ranger Mia.Maybe and just maybe, Saban will attempt to make it a funny series. Actually I think I'm changing my mind over leaving Goseiger. Why? Somehow Epic 30 was a lively episode with its focus on the cute and adorable Eri. It's very epic to see her a pink ranger do a marvelous job. She's just so lively, well I don't think I can leave the series. Hee hee. 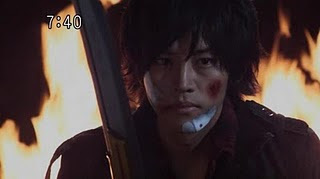 Well it was also nice to see the final battle against Makuin. He was simply revealing how vile he can be. So I wonder why he gets written off before Kinggon. The next episode will be Nozomu's birthday where Kinggon will be the final opponent and the Erurei Box plays a big part too. However I may not be doing too many episode recaps but rather focus on new significant points. In Super Sentai, there have been some entries that have been quite Asian themed. Now moving on my short thoughts on them on their Asian influence. 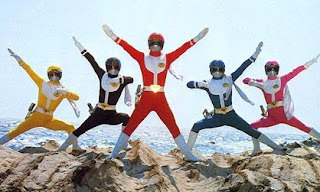 For some reason, I would like to consider Hikari Sentai Maskman as the first Asian-themed Sentai. Why? Well the whole theme focused on Asian martial arts. It mixed both Chinese and Japanese fighting styles. Gosei Sentai Dairanger instead of using Japanese themes, used Chinese themes in almost all the stuff from suits to mecha to the enemies instead of Japanese themes for some reason. To an extent, some characters were actually half-Chinese- Ryou and Lin. Kou, well he may have been pure Chinese himself. 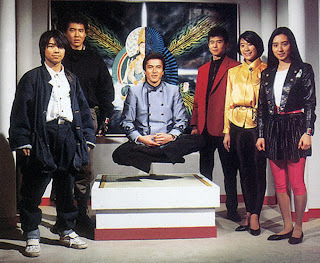 Ninja Sentai Kakuranger was the first that used purely Japanese themes instead of Chinese themes. It also battled the supernatural based on Japanese myths as well. 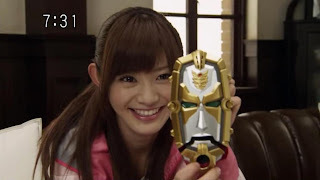 Well I guess I'll do another character spotlight and it would be on one of my favorite pink rangers Mako Shiraishi, whom some consider to be the hottest Sentai heroine as of this decade. In a sense, she does remind me of Kimberly Hart in some ways of being ditzy at first but starts to reveal a different personality as the series progresses. Hee hee hee. So anyway where do I begin? If there was anybody quite interesting among the ladies, it was actually Mako Shiraishi is- pretty as a rose, deadly as its thorns especially in combat. For some reason, Sentai rumors leak earlier now and Goseiger hasn't finished yet. :-P It's said it will be known as Pirate Sentai Goukaiger. Goukai means heroic. So what do I think about what I've been reading from the other blogs? This almost reminds me of Gundam, so will there be Gundam-themed mecha? Also, with the concept that the team travels in a Combat Mothership may actually commemorate the long lost flying fortress idea. 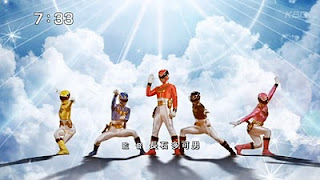 It's said that the Goukaigers will appear in the scheduled crossover of Goseiger vs. Shinkenger. The idea that they will also travel from one world after the other, is almost reminding me of other non-Sentai series like Koseidon or the Tatsunoko anime series Time Boukan and the pirate theme from One Piece. Hopefully it wouldn't be like Decade in terms of plot quality otherwise Sentai will get into a really big dork age already! How Immature Do Children Fanboys Get? If there's anything else I'd like to write about also, is how immature children fanboys can get and children are the biggest source of fan boy quarrels! Children insist 99% of the time they're the ones who are right because they don't understand what life is. So what they like, others must also like. I remembered getting into a fight with adults as a child and later as a teenager, I kept getting into fights with children over the presence of that kind of attitude. Hmmm I guess children in Super Sentai can be blamed for the rise of evil, the return of Ragorn in Turboranger, Radiguet considering humans to be disgusting, Bandora's immense hatred for children, the birthing of Orgs in Gaoranger and the rise of Infershia. 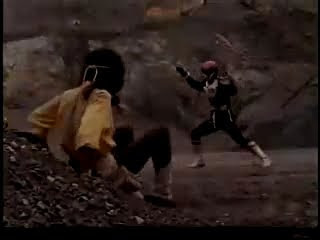 In Bioman episodes 35-36, Yatori tries to imitate the moves of the Biomen to his own disadvantage. In Maskman episode 38, we see a younger Takeru trying to imitate a henshin and nearly broke his bones. 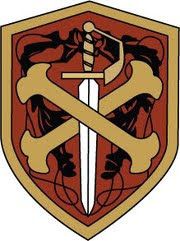 Deaths of the good guys. Naoto Takizawa's death at the hands of a zenitto while out of suit proves even lowly scuds can kill the best cops. Children are shown why they shouldn't be playing with deadly weapons. Well just take a wild guess why this is the entry. :-P Bwahahahaha! Emperor Ragorn- He is the emperor of the 100 Bouma Tribe. It's kind of ironic that Riki Honoo/Red Turbo was able to defeat him in a one-on-one duel. He was killed twice. Dai Satan/Lokar- It's not surprising he's named Dai Satan, after all he rules the Netherworld. 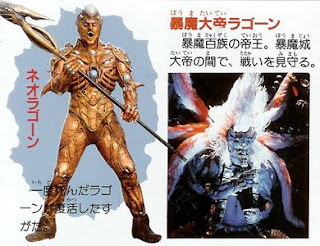 He's the ultimate evil in Zyuranger with whom Bandora sealed a deal with. Like Ragorn, he was defeated twice. However he only appeared in episodes 30-31, 47-50. He was first defeated in episode 31 by Kyokyoku Daiyzujin. In episode 50, his physical form was destroyed. Only if he could just get rid of Hercule in Dragon Ball Z for using his name in vain. LOL. Daimaou/Master Vile- His name literally means Great Demon King. Funny he shares the same name with the antagonist in Akazukin Cha Cha. Children happen to be primary audience. When a Sentai show doesn't get popular to children that much, the next Sentai ends up being dumb down to the extent even violence and suggestiveness is lowered. This is also where most fanboy wars start. If not, there were also teenagers. There are male fans and female fans. I believe mostly male fans because of the lovely girls. :-P There are Sentai female fans too but it's kinda limited. The young adults. Well I'm one of them. 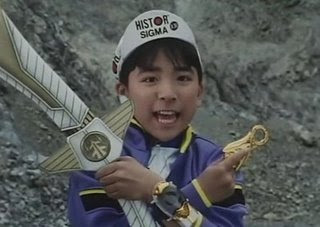 For me, it's harder to outgrow Super Sentai than Power Rangers. Is Super Sentai Getting Too Male Oriented?